The particular declaration I’d like to talk about isn’t the Declaration of Independence, but it is a declaration that may well lead to more independence for individuals with intellectual and developmental disabilities. 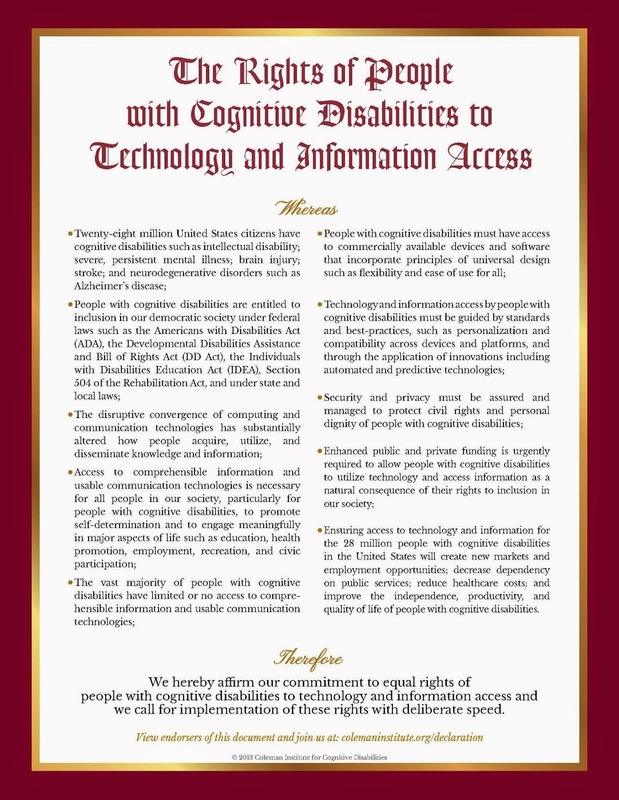 The declaration I am talking about is the Declaration on the Rights of People with Cognitive Disabilities to Technology and Information Access. First, I think we need to be clear that declaring the right to technology access isn’t the same as an automatic guarantee that every technology will instantly be given to anyone who wants or needs it. The U.S. Constitution guarantees the right to a free press, but that doesn’t mean the government is going to give me my own TV station. That being said, the more technology becomes part of the conversation, the more we can change our thinking to incorporate technology into our planning as we design and implement new service models. I am proud of being a citizen of the first state to formally adopt the declaration, but I’d urge them to go further – let’s make Colorado a “Technology First” state, a state in which we look at technology options for service delivery first before looking at other service options. Let’s examine how we fund services, and be sure to create payment mechanisms for technologies that have the potential to create new and exciting opportunities for individuals with intellectual and developmental disabilities. I think that goal is easily within our reach, and the more we can spread the word about the declaration, the more chance we have to reach that goal. So if you haven’t already, please endorse the declaration, either as an individual or on behalf of the organization you work for or support (or both). Let the world know that the community of individuals with intellectual and developmental disabilities and the organizations and caregivers who serve them are united in the belief that all individuals have a right to access comprehensible information and usable communication technologies to promote self-determination and engage meaningfully in major aspects of life. Together, we can create a world where this declaration won’t need to exist because the rights enumerated within will be held as self evident to all. Technology can, and will, break down many of the remaining barriers that have historically prevented individuals with intellectual and developmental disabilities from fully realizing their inalienable rights to life, liberty, and the pursuit of happiness.